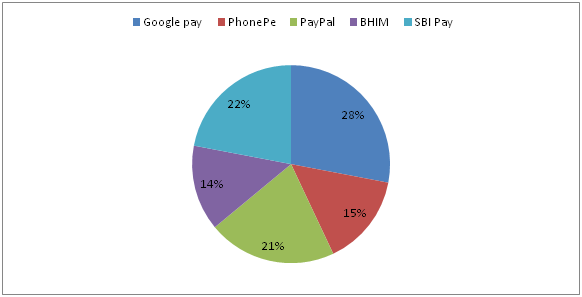 The following pie chart shows percentage distribution of total number people using 5 different payment apps in a certain state. 6. If the total number of people using PayPal is 84000, then find the difference between the total number of people using Google Pay to that of PhonePe? 7. If the total number of people using digital payment app in the state is 400000, then find the average number of people using BHIM and SBI Pay? 8. Total number of people using PhonePe and BHIM together is approximately what percentage more/less than the total number of people using Google Pay and PayPal together? 9. Find the difference between the total number of people using PhonePe to that of BHIM app? Here, the total number of people using digital payments is not given. So, we can’t find the difference between the total number of people using PhonePe to that of BHIM app. 10. Find the ratio between the average number of people using Google pay and SBI pay together to that of the average number of people using PayPal and BHIM app together? 6) If the total number of people using PayPal is 84000, then find the difference between the total number of people using Google Pay to that of PhonePe? 7) If the total number of people using digital payment app in the state is 400000, then find the average number of people using BHIM and SBI Pay? 8) Total number of people using PhonePe and BHIM together is approximately what percentage more/less than the total number of people using Google Pay and PayPal together? 9) Find the difference between the total number of people using PhonePe to that of BHIM app? 10) Find the ratio between the average number of people using Google pay and SBI pay together to that of the average number of people using PayPal and BHIM app together?